What is the Princess Mary Gift Fund 1914 Box? 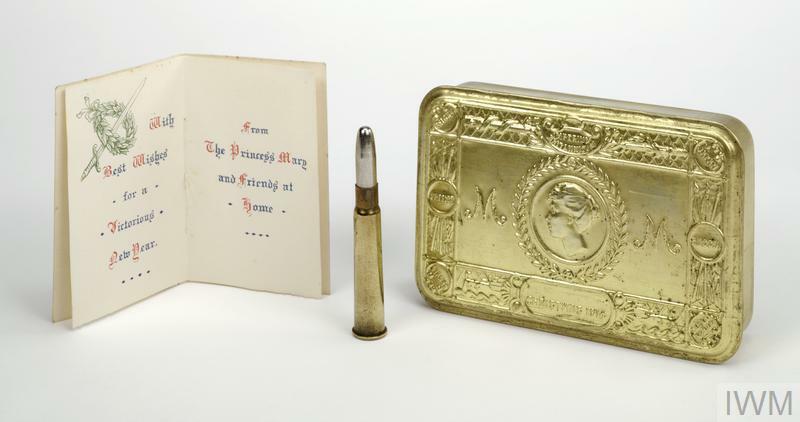 The Princess Mary Gift Fund box is an embossed brass box that originally contained a variety of items such as tobacco and chocolate. It was intended as a Christmas present to those serving at Christmas in 1914 and was paid for by a public fund backed by Princess Mary. Princess Mary's Gift Fund box containing a packet of tobacco and carton of cigarettes. Who might have received one of these boxes? It was Princess Mary's express wish that 'every sailor afloat and every soldier at the front' should have the present. 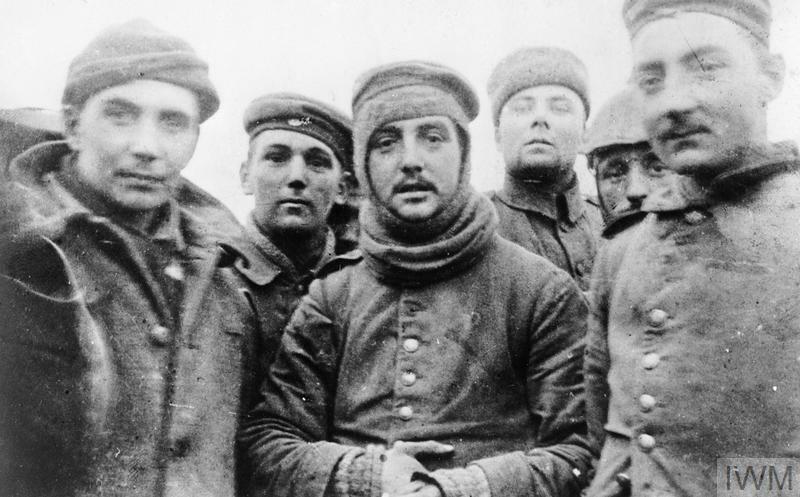 The gifts were devised in October 1914 and intended for distribution to all who were serving overseas or at sea, in time for Christmas 1914; afterwards, with the fund in surplus and many feeling they had been ‘left out’, distribution was extended more widely – to all who were serving, whether at home or abroad, and to prisoners of war and the next of kin of 1914 casualties. This widened eligibility to an estimated figure of 2,620,019. Contents including packet of tobacco and packet of cigarettes, a portrait photograph of Princess Mary, Christmas cards from Princess Mary and King George and Queen Mary. Why were these gifts given? "I want you now to help me to send a Christmas present from the whole of the nation to every sailor afloat and every soldier at the front. I am sure that we should all be happier to feel that we had helped to send our little token of love and sympathy on Christmas morning, something that would be useful and of permanent value, and the making of which may be the means of providing employment in trades adversely affected by the war. Could there be anything more likely to hearten them in their struggle than a present received straight from home on Christmas Day? Please will you help me?" Text: "With Best Wishes for a Victorious New Year from The Princess Mary and Friends at Home". It was anticipated that the majority of eligible recipients would receive an embossed brass box, one ounce of pipe tobacco, twenty cigarettes, a pipe, a tinder lighter, Christmas card and photograph but quite early on the committee in charge received strong representations that an alternative gift should be made available for non-smokers. After some discussion the Committee agreed that non-smokers should receive the brass box, a packet of acid tablets, a khaki writing case containing pencil, paper and envelopes together with the Christmas card and photograph of the Princess. The flap of the pouch is adorned with a crowned M (monogram) and the text: 'CHRISTMAS FUND / 1914'. The Committee was also obliged to consider the tastes of other minority groups and it was recognised that if the dietary rules of various religious groups were to be respected, changes would have to be made in the gifts intended for Indian troops. It was decided that The Gurkhas were to receive the same gift as the British troops; Sikhs the box filled with sugar candy, a tin box of spices and the Christmas card; all other Indian troops, the box with a packet of cigarettes and sugar candy, a tin box of spices and the card. Authorised camp followers, grouped under the title of 'Bhistis' were to receive a tin box of spices and the card. The smokers' and non-smokers' gifts were both deemed unacceptable by the committee for nurses at the front in France who were instead offered the box, a packet of chocolate and the card. However, suppliers of the content items had trouble and it was realised that there were still not enough to go round. The Committee resolved the problem by hurriedly buying in an assortment of substitute gifts: bullet pencil cases, tobacco pouches, shaving brushes, combs, pencil cases with packets of postcards, knives, scissors, cigarette cases and purses. Those sailors who should also have received the lighter as part of their gift, were given instead, a handsome bullet pencil in a silver cartridge case which bore Princess Mary's monogram. The ‘pencil bullet’ was not fashioned out of real bullet parts – it was simply a pencil with a rounded white metal end that looked like an unfired round when stored inside a brass tube resembling a cartridge case. Raising money for the scheme proved a great success and on 18 October 1914 the 'Sunday Times' reporting on the splendid response to the initial request for help, published a long list of well-known names of folk who had already donated money. The total eventually subscribed amounted to £162,591 12s 5d, most of this coming from thousands of small gifts sent by ordinary people from all parts of the United Kingdom. In fact, more money was raised than was needed, even after the eligibility for the gift had been extended. The sum remaining, after all the Fund's liabilities had been discharged, was eventually transferred to Queen Mary's Maternity Home, founded by the Queen for the benefit of the wives and infants of sailors, soldiers and airmen of the newly formed Royal Air Force. Some had a considerable wait to receive their boxes, with difficulties distributing them, and with sourcing both the brass and the contents during the ongoing war. Supplies of 45 tons of brass strip, destined to make more boxes, was lost in May 1915 when RMS Lusitania was sunk off Ireland on passage from the USA. Distribution dragged on even beyond the Armistice in 1918. The final number of boxes produced was over 2.6 million. A Princess Mary Gift Fund Box was a treasured possession of many veteran soldiers of the First World War, even when the original contents – usually cigarettes and rolling tobacco – had long been used. The embossed brass box was air-tight, and made a useful container for money, tobacco, papers and photographs, so was often carried through subsequent service. A great many men carefully repacked their presents and sent them home to their wives and families. Modern reproductions are made of the boxes, though not to the same standard as the originals – typically the brass plate is thinner, and they are not airtight. The records of the Gift Fund are held by IWM, as part of its Women’s Work Collection and you can consult the records by booking an appointment at the IWM London Research Room. A regimental museum website, illustrates the various elements. Copies of all these books can be freely consulted from open shelves at the Explore History Centre at IWM London. Illustrations, in a wide-ranging book. Includes details and illustrations on p564–570. A gift for Christmas: the story of Princess Mary’s Gift Fund, 1914 by Diana Condell in IWM Review (No. 4–1989) p 69–78.